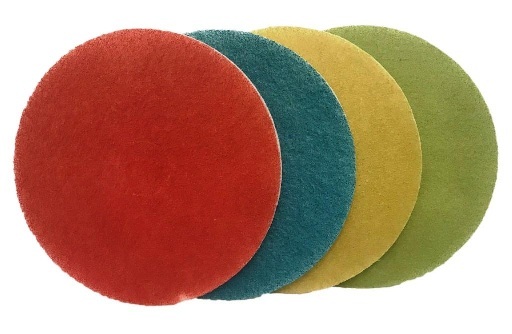 Made with industrial diamonds and available in different sizes and grits, burnishing pads are ideal for restoring the appearance of polished stone walls and floors. Start with low grit pads and work you way through from coarse, medium, fine and very fine pads to restore polish and appearance. Six inch burnishing pads are designed to fit a hand held buffing machine to restore polished stone walls and tricky to reach floor areas. Seventeen inch pads are used with weighted rotary floor machines to remove dirt and restore the polished stone finish. Milling Pads are very coarse low grit pads that can reduce and level the surface of a stone floor, ideal for stone floors where the tiles have not been laid evenly and have lippage issues. 2nd step Polishing, to smooth down rough surface, ready for final polishing, clean grout lines after using this pad.Use only Water. Very Coarse 17 inch 100 grit milling pad with DRB (Diamond Router Bit) segments for milling rough or uneven stone floors and resolving lippage issues. Coarse 17 inch 200 grit milling pad with DRB (Diamond Router Bit) segments for milling rough or uneven stone floors and resolving lippage issues.